As usual, revenue did not keep quiet and filed appeal against the above order in the High Court of Andhra Pradesh. 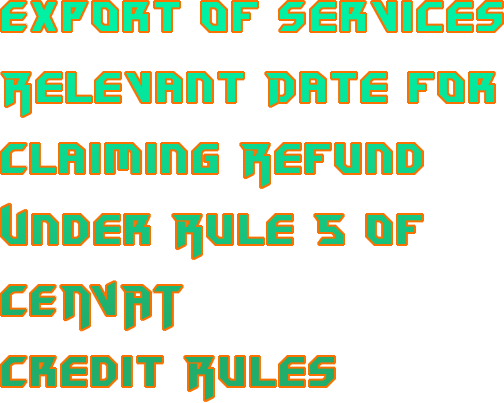 – Whether relevant date specified under Section 11B of Central Excise Act 1944 is relevant for refunds under Rule 5 of the CENVAT Credit Rules, 2004 read with Notification 5/2006-C.E. (N.T.) dated 14.03.2006? – Eligibility of services as input services for grant of refund. – Whether CENVAT credit can be availed on the input services before payments for the services received. It appears the learned CESTAT decided the first issue relying on the judgment of the Bombay Bench of the Tribunal in the case of C.C.E., Pune -I v. Eaton Industries P. Ltd. – 2011-TIOL-166-CESTAT-MUM to hold that the relevant date for calculating the time limit for grant of refund would be the date of receipt of consideration and not the date when the services were provided. If the date of receipt of consideration is reckoned then the claims are perfectly within time limit, and if date of rendering services is taken then obviously most of the claims would be time barred. The Tribunal has held that the relevant date would be the date of receipt of consideration and, when such decision has not been appealed against nor it has been reversed or overruled by any superior forum, the said judgment is binding. The learned CESTAT recorded no contrary decision. As regards admissibility of CENVAT credit on construction service, the learned CESTAT relied on the decision in the case of Infosys Ltd. v. C.S.T., Bangalore 2014-TIOL-409-CESTAT-BANG wherein the definition of ‘input services’ has been considered and admissibility of CENVAT credit in respect of various services and the rationale to take such a view has been discussed. Therefore, on the prayer of the learned counsel for the assessee that the matter can be remanded for calculating the refund claim, following the decision of the Tribunal in the case of Infosys Ltd., the CESTAT remanded the matter to the original adjudicating authority, and it is not argued that the aforesaid decision is appealed against or reversed. In view of the aforesaid adjudication, we do not find any infirmity or illegality in the judgment of the learned Tribunal to hold otherwise, because it is a pure case of remand to consider admissibility of CENVAT credit in respect of various services. We do not find any infirmity in the order of the learned Tribunal.